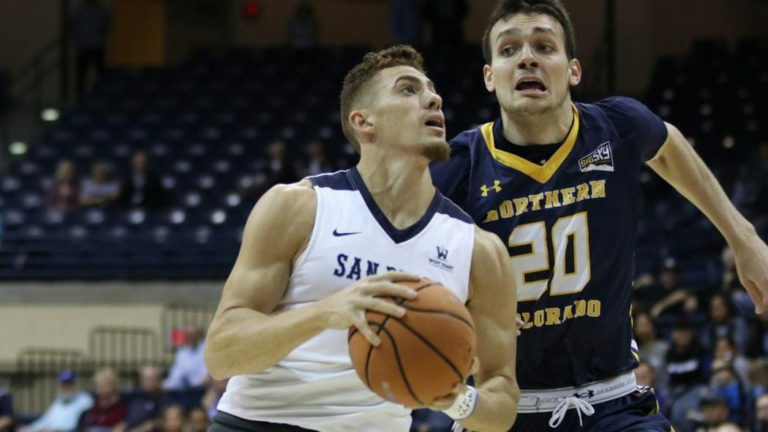 Despite more than 20 points apiece by its two best players, the Isaiahs — Wright and Pineiro, USD men’s basketball team was unable to contain Northern Colorado for a loss Wednesday at Jenny Craig Pavillion in the CollegeInsider.com Basketball Tournament quarterfinals. The season started with so much promise for the Toreros. They had the best start of their 39-year history in Division I at 12-3 and ended the season in disappointment with the unexpected resignation of coach Lamont Smith and a first-round loss in the West Coast Conference tournament. The Toreros (20-14) were leading all through the first half and ended it with a 43-38 lead. By the second half, however, it was a different story. Within the first five minutes of the half, the Bears (24-12) rallied back to tie to score twice before taking the lead for good for the rest of the game. USD, however, continued to fight till the bitter end. With 3:25 left in regulation, Wright made a jumper to cut Northern Colorado lead to three at 71-68. That was the closest the Toreros would get. The Bears then scored nine unanswered points to push the lead to 12 at 80-68 with 58 seconds remaining. Wright tried to rally back by making two jumpers, a free throw and a layup to push close the gap to 8 points at 83-75 with 0:31 left in regulation. A turnover by Tyler Williams and one by Wright ended the Toreros’ rally. USD outshot UNCO, making 53.6 percent of the shots to Northern Colorado’s 47.6 percent. The Toreros converted 58.3 percent of their 3-pointers to the Bears’ 32.1 percent, but it was the turnovers that made all the difference. USD turned the ball over 17 times, 10 of them in the second half with two that directly led the Bears scoring. Pineiro scored 25 points for the Toreros, followed by Wright with 23 points.